Tales Of Five Lies And Stepping Into Greatness! I want to give you my readers, few nuggets to chew on my book, aptly titled, ”Tales Of Five Lies.” And for the record, nobody can predict the end of the world, so why not enjoy yourselves, tuck into your turkey and march into your glorious future! It was a dark and lonely place. Time dragged on excruciatingly slow and I was contemplating going back to my comfortable bed when I saw a man darting behind a tree. All my senses came alive and I watched with apprehension, my hand on the gun my dad gave me before he died. I always take it with me as a safety measure. I stood still watching every movement the man made, I noticed he glanced round briefly, apparently satisfied he was alone then he whistled. Two men emerged from the shadows dragging a bulging bag between them. My mind went wild with all kinds of theory, what could they be burying at that time of the night and how on earth did my best friend got a whiff of their plans? Something was not right, I could feel it deep within my bones. 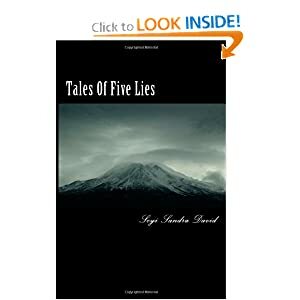 This entry was posted in Books, Short Story and tagged Amazon.Com, Christmas, Family, Fathers, Fear, Gun, Holidays, Home, Huntsville, Literature, Mystery, Opinions, Psychological thriller, Safety, Tales Of Five Lies. Sounds exciting. Hope you’ll be Stepping Into Greatness on the bestseller lists in 2013– Merry Christmas! Merry Christmas Kleverkat and yes, we are still here! Our beautiful home will still be around for a long time. Do enjoy your holiday!!! yes yes..and happy new year. all the best for 2013! Thank you! I wish you the best in 2013! for details about what to do should you accept. Congratulations! Hey that’s so cool! Thanks for the honour, I’m so grateful my friend. Happy holidays!!! Happy Holidays to you, too!! Merry Christmas to you too and I wish you a glorious New Year filled with love and goodness!!! Thank you Julie! I wish you the best holiday season too! !